The most relevant cost in property management is usually the energy bill. It is possible to reduce heat losses by improving buildings envelope or replacing boilers, but these solutions usually require high investments and a long pay-back time. We prefer an accurate management of the heating system: it is easier and has better financial benefits with a lower investment. A service with zero investment for the customer, based on a shared savings mechanism. 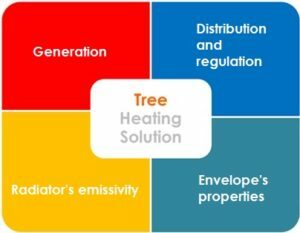 Tree Heating Solution is a solution that uses technology and know-how to find the most thermodynamically efficient heat flow. Tree Heating Solution manages the heating system with a holistic approach, i.e. by considering the whole system, from boiler to radiators to building envelope, as a single entity. Existing technologies available on the market only pay attention to the single parts of the heating system. Tree Heating Solution takes into account the whole spectrum of system sub-sections, bringing out the best performance in each one of them. 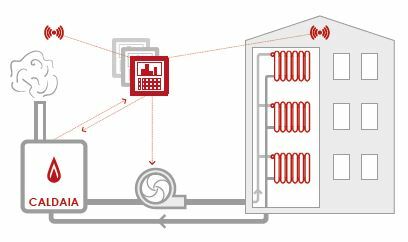 System performance is improved by allowing radiators (or similar) to transfer to the room the exact amount of energy they received from hot water, thanks to the thermal inertia concept. By doing so, THS reduces the amount of natural gas (or other energy sources) needed to guarantee the same room comfort.